ANGELS AND OTHER ethereal creatures inhabit much of the recent work of Hayley Silverman. The artist is interested in how we give form to entities that are understood to be bodiless and genderless. 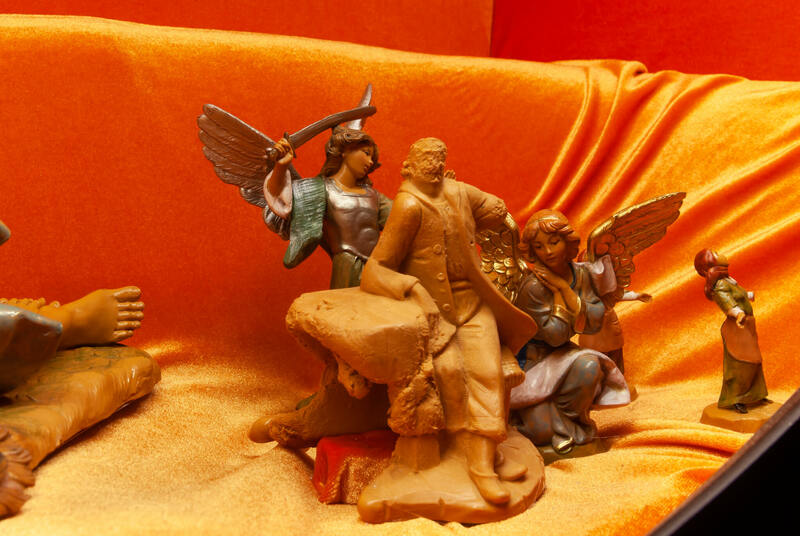 “Protect Me from What I Am,” her exhibition now at the Swiss Institute in New York, features a number of small, industrially produced Catholic figurines in the dimly lit basement gallery.Assimilation (2018) is a mass of deformed beige statuettes, compressed into a large cube and bound together with intestine-like swirls of plastic. On the cube rests a halo dotted with taxidermied birds. Other figurines perch atop lightboxes housing photographs of the artist’s friends, dressed in medieval garb and adorned with exaggerated prosthetic features, as they frolic in a seemingly timeless pastoral landscape (in fact, it is upstate New York). These scenes, like stills from some unrealized film, echo the formal structures of Renaissance religious paintings, but they are populated with members of her queer community. Silverman, who earned a BFA from the Maryland Institute College of Art, is interested in mysticism and in narratives of protection and redemption. Her work traces these themes in everything from biblical figures and cultural traditions to interpersonal relationships and everyday objects. “Entering Heaven Alive,” her show at Bodega on the Lower East Side last year, also featured celestial messengers in a darkened space. (Silverman keeps the lights low in her exhibitions, in part to avoid the inhuman glare of gallery fluorescents but also to create a sanctuary-like space for contemplation.) Service Destiny (2018), a painted ceramic angel with a mirror for a face, hung on one wall; on another, an abstract, hinged angel form rested on a gold- and silver-coated wooden shelf (You are you, and I am I, 2018). These angels watch over us in familiar guises: household trinkets, religious charms. They suggest the possibility of encountering the sacred within the mundane. Earlier works include “Dog Plays,” a series of performances in which a dog freely wanders around an art fair or exhibition opening with a speaker around its neck playing excerpts of dialogue from films and plays selected by the artist—a consideration of how thoughts and emotions are projected onto animals, and a means of ceding control over the outcome of the work. Silverman also made a body of sculptures comprising soup bowls filled with polyurethane food and kitschy miniature figurines. Miniatures “become a bridge to a universe,” Silverman told me. “You don’t need to build a world, you just need to point toward it.” These microcosms are her attempts to grasp what can’t be seen and to portray the damaged, fragmented world we do know as somehow, improbably whole.